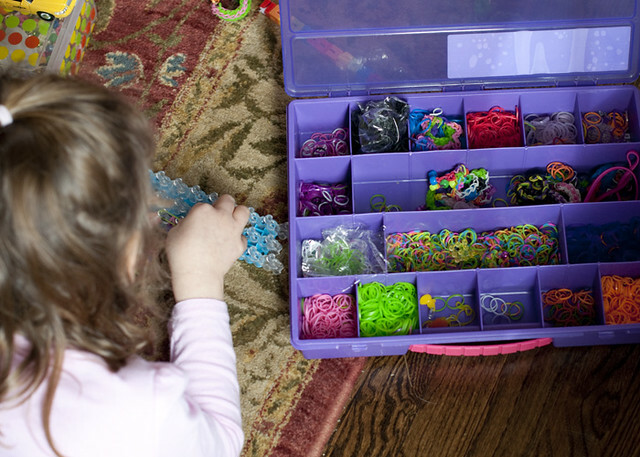 Last summer my mom asked me if I had heard of a Rainbow Loom. I said that I hadn't. She told me to check it out, Charlotte would love it. I went to Michael's and bought one for her. I brought it home and we opened it and read the instructions to make the basic bracelet. We worked on it together and successfully made a bracelet. Then, she wanted to do it on her own. That attempt was not so successful. She ended up VERY frustrated and the loom sat in the box until New Year's. On New Year's day we discovered whole channels on You Tube dedicated to Rainbow Looming. I showed her how to pause and re-start a video so she could loom at her own pace. 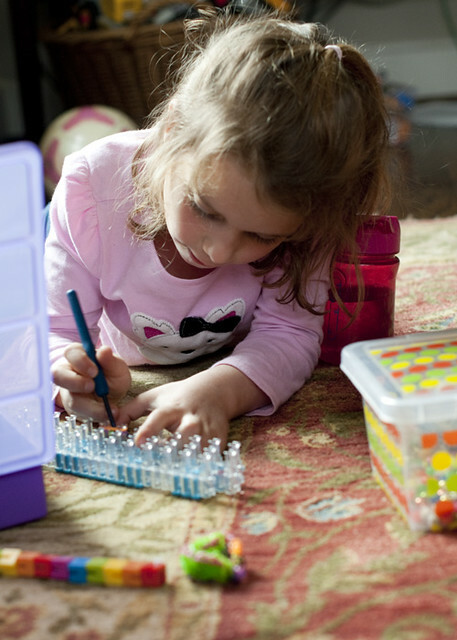 She spend 4 straight hours that day rainbow looming. It was a miracle. The first time this child had EVER done something by herself for a half hour let alone 4 hours. For the next month after that, she was completely addicted. Looming 'til her fingers bled. (Well not quite that much, but a lot). However, there was also a side of the looming addiction that we didn't anticipate. If something did not go quite right on a bracelet - MAJOR tantrums would ensue. It got to the point that I had to restrict access to the loom for a couple of days to let her cool off. If you follow me on instagram, you have seen what she looks like when things don't work out. 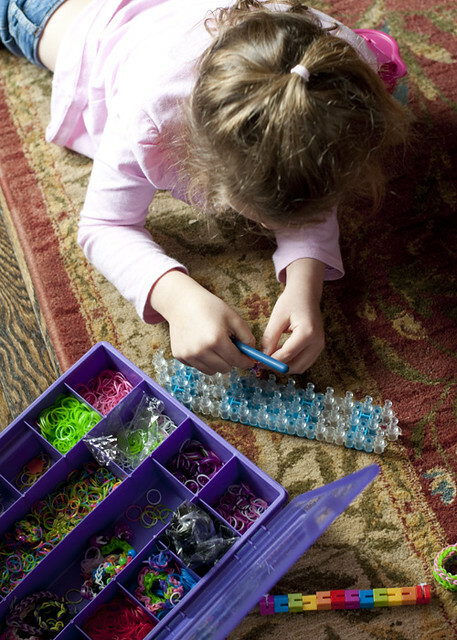 But, now, she is a Rainbow Loom master. She makes mistakes, but now she can correct them herself. She loomed so much that she broke the hook that comes with the loom and we upgraded to a metal crochet hook. She spent all of her birthday money on new rubber bands. She has invented her own "snake" bracelet. She brings home from school orders that her friends on the bus have filled out, so they can have their own custom "snakes". Again, I have had to restrict the time she spends after school to a half an hour. But, this is because she would do it all evening if I would let her. And we probably need to be doing things like learning to read better, practicing math fluency (still figuring out what that is! ), and other kindergartener type things. We even came up with a little tag for her creations when she passes them out to people. 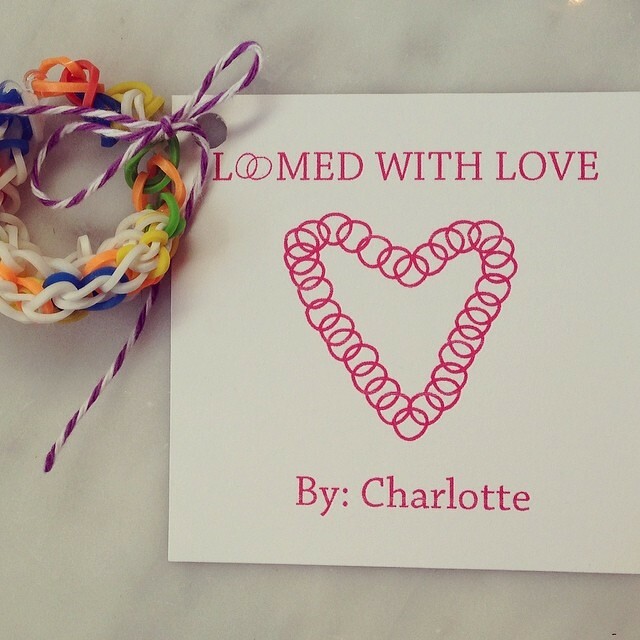 I created a PDF you can dowload if you have a little rainbow loomer that wants their own tag too! Just download here! And, here's a version for any boy loomers out there: download here. I'm glad she's gotten so much better at it! Send a snake bracelet up my way!